A creative jeweller has proved diamonds are actually a girl’s breast friend – by creating jewellery from pure breastmilk. Over the past two years Sierra Perea (25) has produced hundreds of special pieces for people to keep their loved ones close. From rings made with cremation ashes and umbilical cords, to funeral flowers and pet fur inside necklace pendants! There are few materials Sierra haven’t yet used in her art. But her trademark is making rock-hard jewellery pieces from pure breastmilk, which is where the name of her company, Mama Bear Milk, comes from. 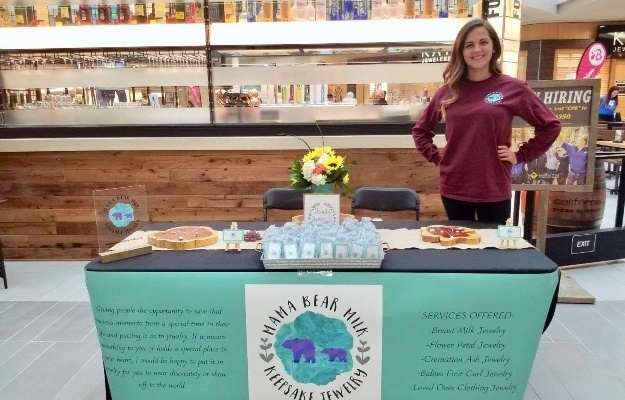 Sierra, from White House, Tennessee, said she started making keepsake jewellery in 2017, when she wanted to get her best friend a breast milk ring. “It was because I was so proud of how good she was doing breastfeeding her child. Mom-of-three Sierra said she started practising with her own milk as, at the time, she was breastfeeding too. She now also uses other materials like the ashes of both humans and pets, hair, sand and pieces of clothing. People who want breastmilk jewellery created by Sierra send it to her in plastic sachets. She’s now planning to open a store where people can come with their keepsake in hand and pick the type of jewellery they want. “There’s not a material I can think of that I haven’t used, but I do get some requests that I haven’t thought of. “Someone asked me to use the lenses from a loved one’s eyeglasses by crushing them and creating a keepsake stone with it. “The only material I’d rather not use is blood. I’ve had one person ask me if I could use blood and I had to turn them down. “The thing I enjoy most about making keepsake jewellery is the customers' reaction and gratitude.